We are proud to announce that we have been voted Best Pool Company & Best Pool Service Company for 2018! We’re humbled to say that this is the ninth year in a row we’ve won. 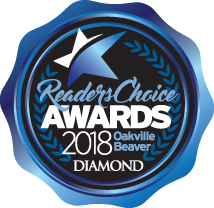 Thank you to all who voted for us in the Oakville Beaver Readers’ Choice Awards. We are also very proud to be past recipients of Oakville’s Small Business of the Year Award. We truly appreciate the support from our customers, staff, suppliers and other partners for helping us earn this prestigious award. We are also honoured to have received several prestigious Awards for Outstanding Pool Builds and Renovations from the Pool & Hot Tub Council of Canada. Dave and his team at Total Tech have been amazing on all fronts. They are very knowledgeable on water testing and balancing with detailed instructions on how to remedy. Dave researched how to sync various systems when I wanted to install a high efficiency pool pump. Their pool closing service was impeccably done. Thank you Dave and team. I highly recommend Total Tech to my friends. Thank you Total Tech Pools! For years I’ve looked for a reliable pool company to open and close my pool along with service. On time, very professional. Keep up the good work. I will recommend you to all pool owners. We had just purchased our new home in 2011 and was the first pool we owned. I knew going in that we would definitely need a lot of work done, that’s when I met Dave and he also introduced me to Roy of Rosa and Rosa landscaping. Dave and his team were always professional, courteous, and true to their commitments. Dave never tried to oversell. He was upfront and honest on what I needed for my pool. He even made recommendations that lowered my costs. Extremely pleased by the work done by Total Tech Pools.